The advent of DNA origami in 2006 launched many new fields into scientific orbit. This initial discovery revealed that DNA could be folded into elaborate shapes purely through molecular interactions. It therefore became possible to easily design a large variety of unique nano-sized assemblies with not only DNA (Figure 1), but potentially any chemical entity that could be bound to DNA. The authors here summarize a few different possibilities for creating never-before-seen optical systems by combining DNA origami with plasmonic nanoparticles. 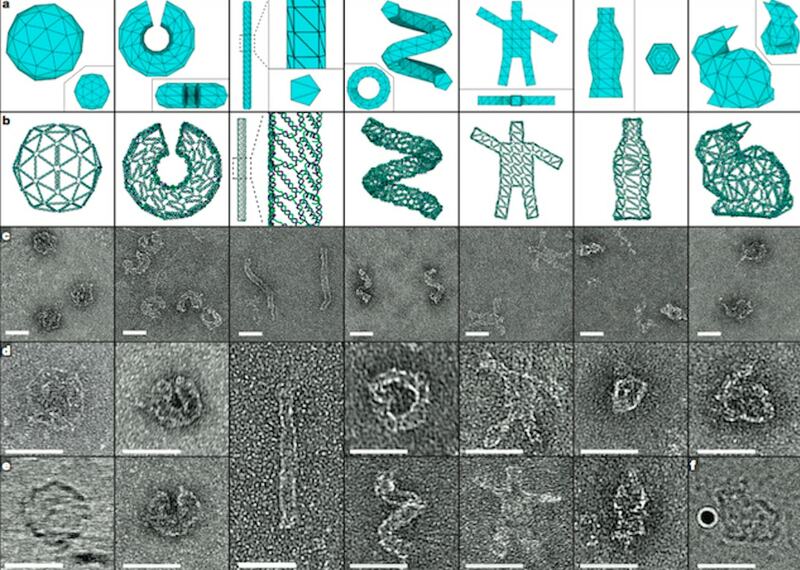 Figure 1: DNA Origami – Examples of the elaborate structures that can be formed through molecular interactions of DNA strands. The interactions of the bases that make up DNA can be used to self-assemble complex structures, enabling applications such as DNA origami (Figure 1). If we think back to our introductory biology courses, DNA is composed of four chemical bases – adenine (A), guanine (G), thymine (T), and cytosine (C). A’s pair with T’s and C’s pair with G’s through hydrogen bonds to give DNA its typical double helix shape. However, similar interactions are at play when multiple strands of DNA are combined together, giving them the ability to form a variety of 3-D structures other than a helix. 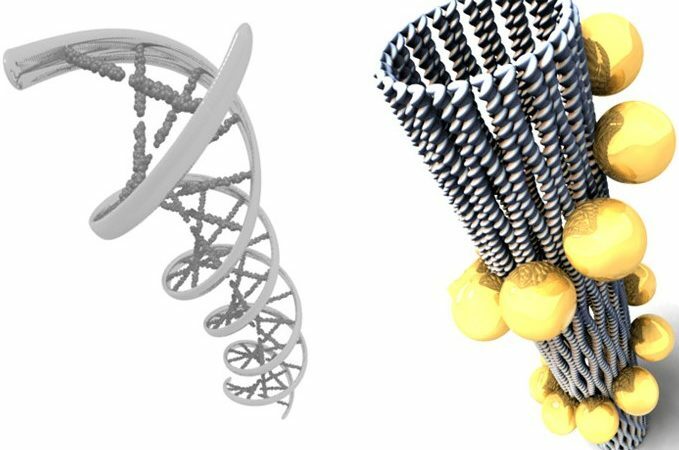 Through tailored design, researchers unlock the ability to create exquisite 3-D shapes using specific strands of DNA. Nanoparticles are small clusters of atoms, ranging in size from 1 nanometer (nm) up to roughly 100 nm. Due to their small size, they exhibit very different properties from the bulk material, discussed further in a previous article. Gold nanoparticles (AuNP) in particular have been a topic of discussion in a few previous posts and have a wide variety of applications ranging from cancer therapeutics and medical imaging to enviromental remediation and architectural applications. Many of these applications center around a single important phenomenon known as surface plasmon resonance (SPR). Just as light is composed of packets called photons, a conductive material’s electron density fluctuates in the form of packets called plasmons that can interact with light. When placed in close proximity, the plasmons of these nanoparticles can be coupled to yield interesting optical phenomena. By chemically adhering the AuNPs to strands of DNA, it is possible to create unique nano-composite assemblies with a variety of optical applications. Figure 2: Gold nanoparticles were adhered to DNA origami bundles in a helix fashion. Interestingly, the chirality (handedness) of the helix changed the resulting optical properties, measured by circular dichroism. The left-handed helix is shown in blue, while the right-handed helix is shown in red. The first types of systems discussed in the article are static chiral plasmonic systems. These systems are primarily useful as a proof of principle for exploring the fundamental optical properties of DNA-nanoparticle composites in situations where the molecules are relatively static in solution. In the example here, the gold nanoparticles were arranged in such a manner that the handedness or chirality of the system could be changed to probe optical properties. Figure 2 conveys the intriguing result that the chirality of the gold nanoparticle arrangement around the DNA bundle changes the optical properties of the resulting structure. Considering the properties of light and plasmons, this result is not incredibly surprising. This led to the general conclusion that the orientation of nanoparticles in space significantly affects the resulting optical properties. Other physical arrangements are discussed further in the article. Figure 3: Dynamic systems can be designed that response to external stimuli to elicit a measurable optical response. Whereas static systems are used as a proof of principle, dynamic systems are where the real applications come to life. Since DNA is a complex biopolymer, it exhibits changes in properties when the conditions of the system are changed. 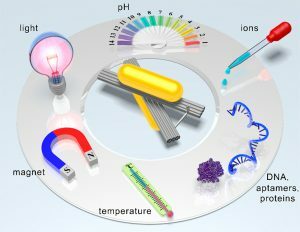 In a few examples, researchers change the pH of the solution and gauge the resulting change in optical properties, successfully creating a pH-responsive sensor. An additional application focuses on the system’s response to UV light. As shown in Figure 3, many other possibilities can be imagined for applications of this type of dynamic system. An additional intriguing dynamic system developed in this work is one that allows AuNPs to “walk” across DNA (Figure 4). By adding specific reactants that allow the AuNP to bind to adjacent strands (A-F), it is possible to monitor the movement of a nanoparticle across a DNA origami scaffold using purely optical properties. These walkers are inspired by molecular motors in living cells such as kinesin that are capable of carrying cargoes to distinct locations and could possibly be used in the future for more complex applications. The article discusses a few other examples of fascinating dynamic applications for the interested reader. Figure 4: Chiral plasmonic walkers – Optical properties of the system change as the AuNP moves across the DNA structures. Many research groups are currently looking to answer questions similar to these and we should continue to see intriguing applications in the near future.